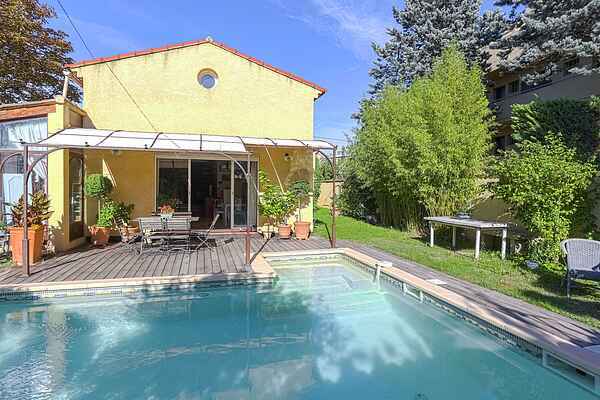 Within the lively Aix-en-Provence you can find a true little paradise. This detached holiday home offers privacy in abundance due to it being surrounded by a fence. Which means you can enjoy your villa in peace. There is a shopping centre at only five hundred meters distance from the house. You can also find an eighteen hole golf course near the city. You'll want for nothing, let your holiday begin! In no time at all you'll have reached the charming centre of Aix-en-Provence. The centre is situated at 2kilometers from the villa. In the centre take a stroll on the Cours Mirabeau. Because of the stately town houses and the numerous cafes this is the most beautiful boulevard in the city. The famous 18th century pavement cafe 'Les Deux Garcons' is located here. The famous French painter Paul Cézanne spent a lot of his time here. Learn more about the life of this famous inhabitant of Aix-en-Provence with a tour through the house he was born in and his studio. Beside cultural interests there are plenty of sporty opportunities. The beautiful beaches between Carry-le-Rouet and Sausset-le-Pins (45km) offer lots of water fun and the mountain range Sainte-Victoire is ideal for cycling and walking.